Ohio political columnist Thomas Suddes reads from prepared notes during the League of Women Voters of the Greater Dayton Area's "Election News You Can Use" event on Wednesday night in Centerville, Ohio. 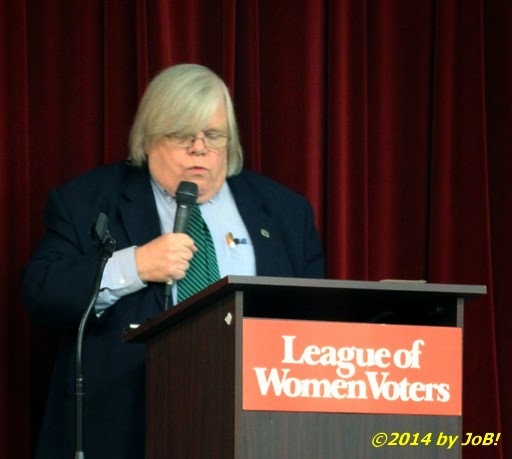 Veteran Ohio political columnist Thomas Suddes was the featured speaker to a crowd of 75 people at the League of Women Voters of the Greater Dayton Area, or LVWGDA, “Election News You Can Use” event held Wednesday evening at Centerville’s Magsig Middle School. 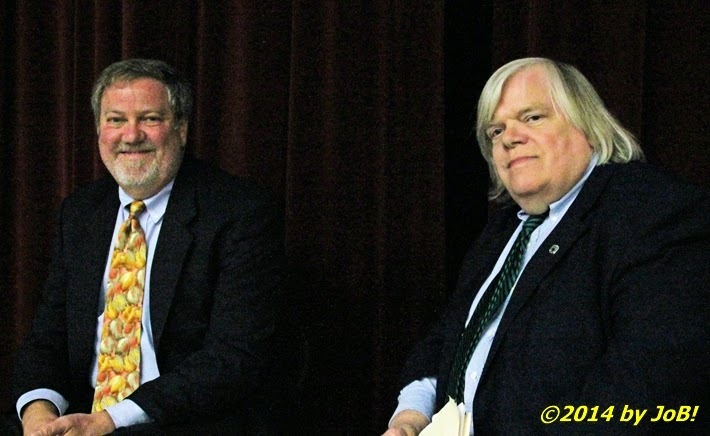 Ron Rollins, senior editor at the Dayton Daily News, introduced Suddes to the audience that wanted to get the journalist’s take on the upcoming statewide races as well as his historical takes on Ohio’s election process and political issues. His weekly column on Ohio Statehouse happenings appears in The Columbus Dispatch, The Plain Dealer as well as the Dayton Daily News. Suddes was recently elected into the Cleveland Journalism Hall of Fame and serves as an assistant professor and coordinator at Ohio University’s E.W Scripps School of Journalism. Ron Rollins (left), senior editor at the Dayton Daily News, chats with Ohio political columnist Thomas Suddes prior to the League of Women Voters of the Greater Dayton Area's "Election News You Can Use" event on Wednesday night in Centerville, Ohio. Ron Rollins, senior editor at the Dayton Daily News, introduces Thoman Suddes to the League of Women Voters of the Greater Dayton Area's "Election News You Can Use" event audience on Wednesday night in Centerville, Ohio. 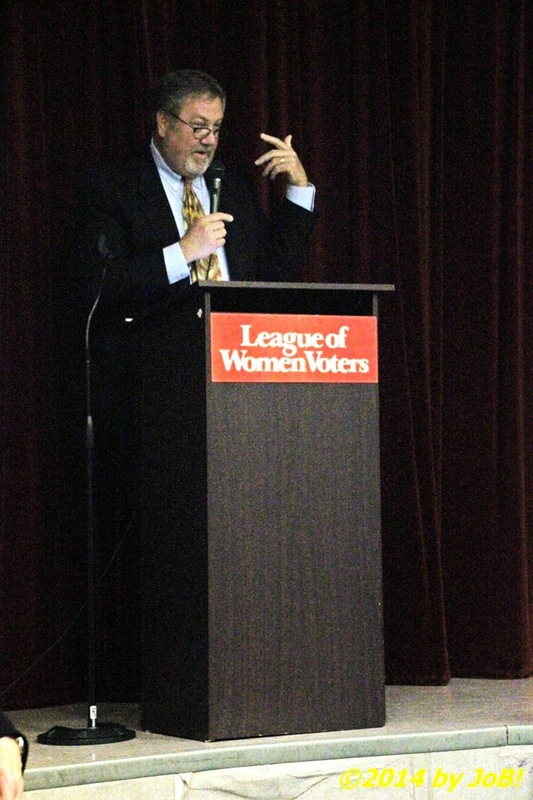 In addition to the columnist, several local politicians and judicial members gave short presentations to the audience in support of their current candidacies to include one for the State Board of Education, two for the Montgomery Court of Common Pleas and four others for Montgomery County government positions. As a nonpartisan political organization, the LVWGDA encourages the informed and active participation of citizens in government, works to increase understanding of major public policy issues, and influences public policy through education and advocacy. On October 6th, the organization will be hosting a candidates public forum to be held at the Bethany Village Retirement Community, located at 6451 Far Hills Avenue in Dayton. Another forum is tentatively scheduled for October 22nd in Centerville with further details to be released at the LVWGDA website's calendar. 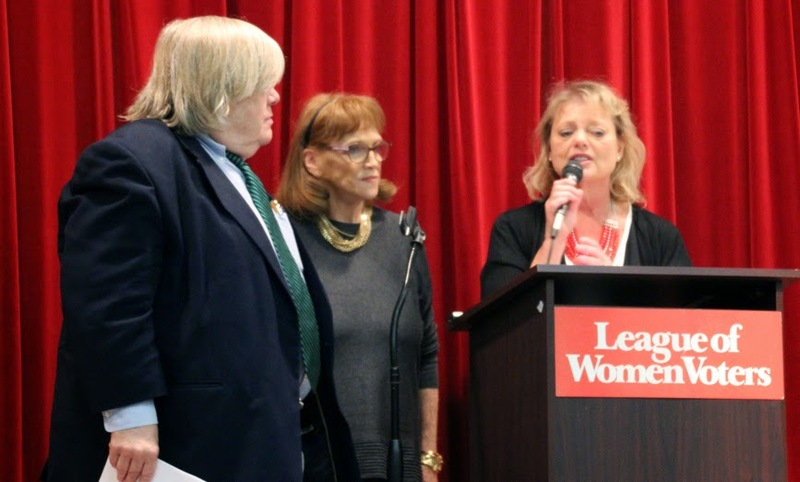 League of Women Voters of the Greater Dayton Area's executive director Susan Hesselgesser (far right) and president-elect Patty Skilken (center) thank Ohio political columnist Thomas Suddes at the conclusion of his presentation at the "Election News You Can Use" event on Wednesday night in Centerville, Ohio.